Genesis chapters 5 and 11 provides an interesting genealogy from Adam to Abraham. 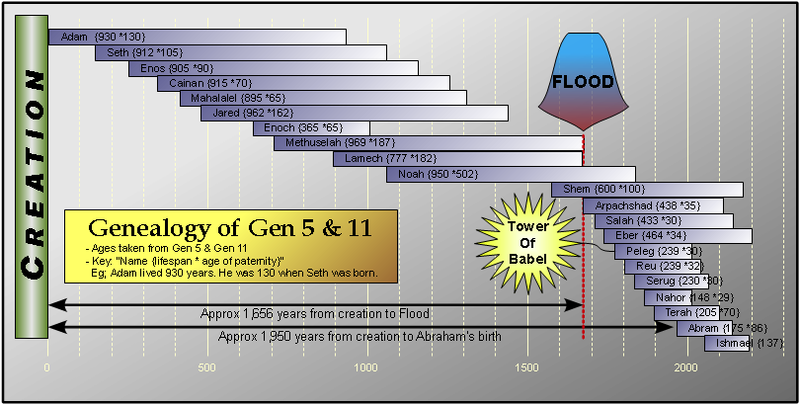 But the genealogies of Genesis 5 and 11 are quite different from other genealogies in the Bible: these are the only two Biblical genealogies where years are given for the age of paternity (eg “When Adam had lived 130 years, he fathered a son in his own likeness, after his image, and named him Seth.” Gen 5:3). So while people may insist there are more names in the genealogy, they cannot insist that there are more years in the genealogy or they make Moses out to be a liar. Not only was Moses quite specific when he wrote out the the age of Person A when Person B was born, but he was also under the inspiration of the Holy Spirit. There can be no wiggle room. Either Moses (and the Holy Spirit) is right, or he is wrong. We can say “wellll.. ‘begat’ really means ‘ancestor'”, but we cannot say “wellll.. age X really means age Y” (although Harold Camping certainly tried). So what do we see if we list the ages as Moses gave them? Glad you asked. *AM = Anno Mundi – In the Year of the World. Counted from the first year of creation. **Gen 26:11 can be misleading. However, If you do the math on 11:31 and 12:4, you’ll see that Abram was born when Terah was 130. There are 10 people from Adam to Noah (the flood) and, likewise, 10 people from Shem to Abraham. This symmetry might be an excellent reason for concluding that Moses is simply using a mnemonic device and not giving literal time lines. However his use of lifespans and paternal ages is still an issue that we can’t skirt, and I maintain that this is an excellent reason to insist that Moses intends to be literal. The flood takes place about 1,656 years after creation. To get an idea of the population of the world after 10 generations, see this link. Bear in mind that people living in an agrarian culture with plenty of fertile land, natural resources, and a relatively clean gene pool, the more kids a couple has, the better off they are. There would be little incentive to not produce many children, and every incentive to reproduce extravagantly. Furthermore, pre-flood humans lived about 10x longer than we do today. If today’s females can give birth up to about 40 years of age, it’s safe to assume they could do so up to about 400 years back then. So if they birthed 1 child every 7 years, each couple would have 50+ children. If that sounds outlandish, bear in mind that Josephus wrote that Adam had 33 sons and 23 daughters. No, Josephus isn’t inspired, but in light of this reasoning, his statement isn’t as outlandish as it might sound. If 50 children per couple was anything close to the norm, then the “10 sons” column on the Generations page presents woefully low numbers. Lifespans after the flood are dramatically shorter than lifespans before the flood. So much so that Shem, son of Noah, outlived Abraham. If this listing is literal, there’s no reason to believe that Abraham did not personally know Shem. In fact, some ancient rabbis believed that Melchizedek, king of Salem, was none other than Shem. That’s certainly plausible. If the Jewish tradition is correct about Melchizedek being Shem (and there’s no real reason to reject this tradition), it’s completely plausible that Shem faithfully relayed to Abraham the events of the world prior to the flood. Abraham would then have a pretty reliable source of historical knowledge dating all the way back to Adam. And the minimum descendants from Abraham to Moses is another 6 or so people. More we could say about this.